I have covered a lot of ground since I left my friends’ place in Lemitar, New Mexico a three weeks ago, roughly 1,500 miles. That is a lot of different scenery. Instead of giving you a step by step detailed report, I will give you the highlights of the trip, including some random thoughts / observations. 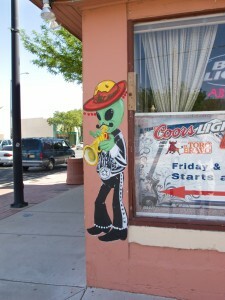 I had heard a lot about Roswell, NM and people told me I should stop there to check out the International UFO Museum. First off, I did not get abducted. Several blocks of downtown Roswell are all about aliens, green little guys. It doesn’t matter if it is the tax preparer or the gift store, everyone has an alien painted on the window, a little much if you ask me. I didn’t go into the museum, only to the gift store, I can only take so much. The story about Roswell is that in 1947 a UFO crashed in the area. It wasn’t until the late 70’s until conspiracy theories started to develop about a government cover-up as to what was recovered back in 1947. Was it a surveillance balloon or some spacecraft and its occupants? Will we ever know and do we really care? At least Roswell has been attracting visitors from all over the world. 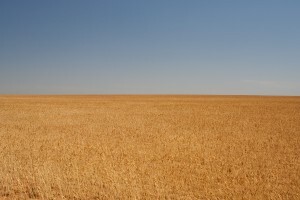 nothing but fields all the way to the horizon and beyond. There are lot’s of feed lodges along hwy 60, pretty smelly in some areas. My destination was the Palo Duro Canyon. I had been in the same area last June, but back then the Canyon was flooded and therefore closed. This time the weather was perfect. 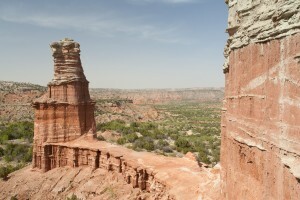 Palo Duro is the second largest canyon in the US, after the Grand Canyon. Have you ever heard of it? The canyon is 120 miles long, 20 miles wide and 800 feet deep. Only a relatively small area has been turned into a state park, the rest is owned privately and is inaccessible to the public. explored the mesa behind my campsite. What fun it was to be able to take advantage of all those climbing possibilities. I have to admit that I was a little more hesitant than I used to be and always took the easier way out. Palo Duro is not as intimidating as the Grand Canyon and at this time of year not nearly as crowded. Who wouldn't like to wake up to this? From Palo Duro I went via farm roads and small highways to Dallas. I don’t like Dallas, but I have to admit that I found some interesting places this time around. And as long as you stay off the freeways, it’s not so bad. I didn’t come to Dallas to find interesting places, but to visit my friend Lynn. Thank you Lynn for letting me stay, not only the planned two nights, but three. I love visiting my friends; I hate to say good bye. I just never know when I’ll see anyone again. Before I reached Dallas I drove through a lot of grassland, big ranches with cattle and horses. From time to time the earth opened up and all of a sudden there was a canyon, totally unexpected. 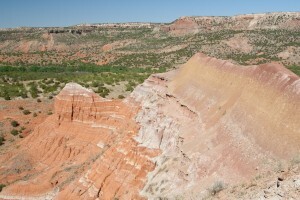 Caprock Canyons State Park was one of those surprises, a small park but with nice hiking trails. Not only have I crossed time zones moving east, but it seems also weather zones. When I left Nevada “way back” at the end of March the temperatures had already reached the 80s. New Mexico was not quite so warm (26F in the mountains over night) and the western part of Texas greeted me with 103 F, back into the 60s just a few days later. The West has been very dry and everywhere a fire ban has been in effect; a stark contrast to the East where it has been raining seemingly non-stop. Besides visiting with Lynn in Dallas, I also took care of some errands. Once again, I was totally overwhelmed when I walked into one of the supermarkets. The produce section alone was larger than most of the supermarkets I had been shopping in; too bad that produce just don’t last very long. Originally, I had planned on just driving east back to New York. If you have been following my travels you might have noticed that plans are meant to be changed. Since I still have two months to get back to New York, I decided that I would drive up to Nebraska. I once drove through Nebraska back in the late 90s on I-80. I remember liking the area and now I want to go back. 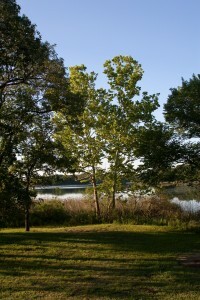 This post has taken me several attempts to complete and as I am writing this, I am sitting at Lake Ouachita (Wash-i-taw – don’t ask) in Arkansas. The drive from Dallas to Oklahoma and now Arkansas has been full of surprises. Again, I stayed on the smallest roads possible and I have been at awe at all the green and all the trees; oak, cottonwoods, maple, pine and many more. You have to remember that from mid December on I have not seen many trees or green grass. Yes, there was the Gila Forest, but that was mostly evergreens and in a relatively small area. But now just driving down a country road seeing all this lush greenery is just wonderful. The biggest surprise to me was Oklahoma. The only thing that came to mind was – dust bowl. But the south eastern corner is anything but. 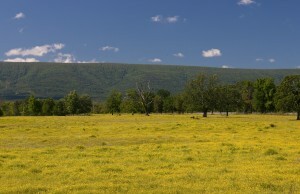 It is all GREEN, meadows with wildflowers framed by trees. The smell of morning dew on the grass, it just smells so fresh. highway, no hook-up, no lights and no people. I crave solitude when I am out in nature, the quieter and further away from people the better. 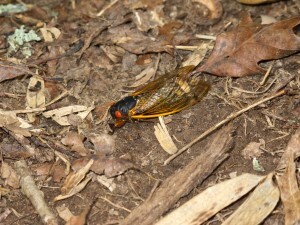 I prefer nature’s music at night, cicadas, crickets, frogs and the wind in the leaves is just fine with me. The moon was watching over me, not quite full yet. 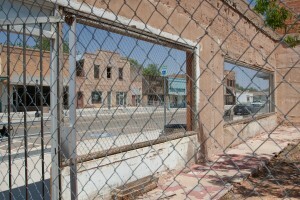 their condition; storefronts boarded up, buildings falling apart or just a shell of a building standing. I don’t even like to take photos of these places anymore. The downturn does not necessarily stem from this recession. I spoke with a woman in one of those towns and she said that some of the stores had been empty for ten years! People just moved away to find jobs elsewhere. Arkansas seems not to fit that mold, at least the 100 miles I drove through so far. Even just the houses along side the road seemed to be in better condition than what I saw in the other direction over in Oklahoma. I drove through chicken country, many Tyson signs next to the farm’s name and many, many, many chicken houses, those long ones where the chicks get raised. Paris to Detroit via Reno in less than an hour, only in Texas. I have been hiking or walking in the woods in Oklahoma and Arkansas. As pretty as the trees are, I get a little bored walking through the forest. There is nothing to climb on; I need some rocks to climb over, a little challenge and fun. 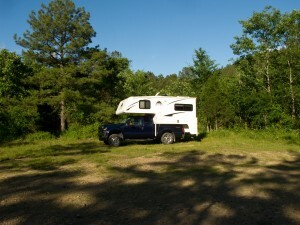 Fourteen months on the road – 30,000 miles, but who is counting. This post had been further delayed due to lack of internet connection. My family is from the panhandle all around Lubbock and my dad has a painting of the Palo Duro over his fireplace. You were in my home turf. Good for you for going to Joplin. Annika & I think we’re going to make our trip in 2 1/2 weeks, then pick 2 or 3 of your photos of the places we’ve been and order large-ish prints for our living room, since you sure take better photos than we do! We’ll keep you posted. We’re thinking Antelope Slot Canyon and maybe Bryce. Palo Duro is a neat place and a well kept secret, until now. You should have a lot of fun in Page and Lake Powell. Are you going to rent a boat while you are there? Bryce is not too far away. On the way there, stop at the Pink Sand Dunes State Park west of Kanab. Kind of neat to see salmon colored sand. Thanks for the photo compliment.